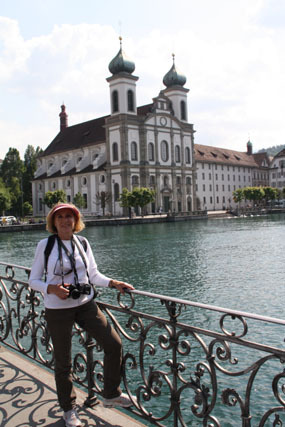 While visiting family living in Wadenswil, Switzerland last spring, Larry and I took a day trip to Lucerne, about an hour’s drive away. Our first adventure was a trip up Mount Pilatus, which can be accomplished by aerial cable car or on the world’s steepest cog railway, with grades up to 48 degrees. Since it was a beautiful sunny day, we decided to take the cable car up and the railway down. We drove to nearby Krienz, where the cable car up Mount Pilatus started. Only after we had paid for four hours parking did we realize that another option was a boat ride on the lake back to Lucerne. But parking is monitored very carefully in Switzerland, and we didn’t want to get a ticket, so we stuck with trains, which are the main means of transportation in Switzerland, as a quicker option. Even so, the train down from Mount Pilatus stopped in Alpenstadt, a nearby town, so we had to take another 20-minute train ride to Lucerne and then a city bus back to Krienz where our car was parked. Public transportation is the norm, and it’s easy to get confused in a country where you don’t speak the language. Fortunately, compassionate people are usually eager to help--as was the young man who graciously alerted us when to get off the bus to return to our car. But there’s hardly a more beautiful and captivating city in Europe than Lucerne, so even those hiccups couldn’t dampen our delight in being there. To ascend Mount Pilatus we rode in a four-person cable car with amazing views overlooking the city and Lake Lucerne. 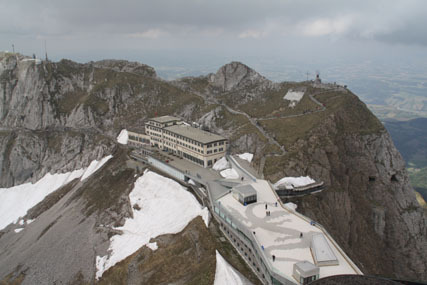 Then we switched to large 40-person cable car that took us to the top of Mount Pilatus. What gorgeous scenery! It’s everything you imagine about mountains and lakes in Switzerland—and even better. Cows in the meadows, isolated churches nestled in mountains, and clouds drifting over snow-covered peak. Despite the chilly air, we wandered outside of the research/visitor building for photos. We walked foot paths, including one that looped through a tunnel. 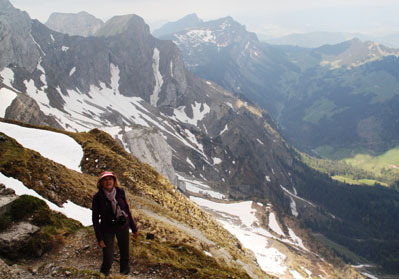 A10-minute uphill path to the highest peak of Pilatus offered more breathtaking picture-book scenes. 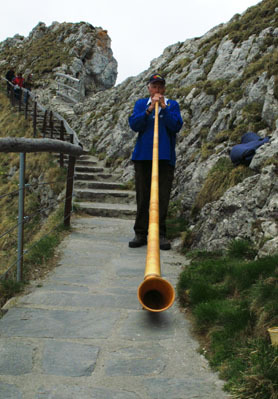 Along the path, a Swiss man entertained visitors playing songs like Amazing Grace and Edelweiss on his super-long horn. Back inside the visitor center, we had a snack, sitting by windows to soak in the view. For the return trip on the cog railroad, we sat in the first car directly behind the driver. Going downhill at such a steep grade was quite an experience, but we had an excellent vantage point to appreciate the ride. At one point the track ended, and the train came to a quick stop. When another train approaches from the opposite direction, the tracks flip over to prevent two trains colliding. After the other train went by, the tracks flipped back, making a transition that allowed our train to continue. After finding our way back to our car, we drove into Lucerne to visit the historic and shopping districts. Lucerne's location along the River Reuss at the end of Lake Lucerne has made it a popular tourist destination. We arrived in Lucerne mid-afternoon, perfect time for a glass of wine and brochette at an outdoor Italian restaurant. Seated beside the lake, we watched swans swimming in the water and many tourists wandering around. Refreshed, we walked across the famous Chapel Bridge, a wooden bridge first build in 1333 and rebuilt after the original burned in the 1970s. It's 669 feet long, covered, and filled with frescos depicting historic events in Swiss history. One of the notable sights is the Church of St. Leodegar, with its two needles pointing to the sky. Originally built in 734, the present structure, on the other side of the lake, was constructed in 1633.Other ancient buildings in the historic area provided great photo opportunities and a peek into the city's past--and contrasted with high end. 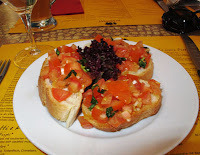 modern shops that catered to visitors. Despite our tourist-induced glitches, the day turned out just fine.